Mormon Wookiee: #96: "The Staying Power of Star Wars". #96: "The Staying Power of Star Wars". 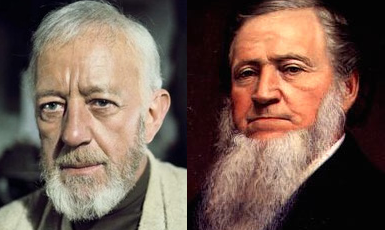 A couple of years ago, I started Mormon Wookiee because I enjoyed the way that Star Wars and the gospel had certain parallels to one another (the battle between light and dark, the force in comparison to the Priesthood, the fact that both Obi-Wan and Brigham Young have sweet beards, etc.). Beards: They grow on you. Anyway, last week I read a great article in the Deseret News about Star Wars and the gospel that totally made me my day (and made me excited to have kids). Here are some highlights from "In the Whirled: The Staying Power of Star Wars" by Tiffany Lewis. "We did something this year that has tilted the Lewis world on its axis. We introduced our children to Star Wars. Life will never be the same again. "What astonishes me most is the urgency of this story, the need for them to connect it all in their heads. My 9-year-old calls to me after I’ve put him to bed. 'Mom, Mom!' He is frantic. I run in and kneel by his bed. 'What is it?' 'Would you rather live on Cloud City or Alderaan?' he asks. I slow my breathing. 'Go to bed,' I tell him. "I sat my kids down to dinner the other night, intent on having a real conversation, the kind that happened B.S.W. — Before Star Wars. 'We’re studying the prophet Lorenzo Snow in Relief Society,' I tell them. 'He lived on a farm, and because his dad was gone so often, he had to do all the work. Can you imagine?' Their interest is piqued. 'He lived during the time of Joseph Smith and Brigham Young,' I continue. They are listening. This is going to be a great discussion. We’re going to talk about hard work and conversion and the powerful choices you can make at a young age. There is a pause. My 7-year-old pipes up: 'So if Lorenzo Snow lived that long ago, I guess he wouldn’t have known George Lucas?' You see what I’m up against here." I love it! I think I would have followed up with, "No, but as a farmer, he definitely would have known Luke Skywalker." Thanks for the great article, Tiffany! Thanks for pointing this out to me. That was a fun read. I introduced our six year old to Star Wars this past year when Phantom Menace got its 3D re-release. We went right on through and watched the other five. Now we have nightly lightsaber fights before bed (my wife made them by cutting water noodles in half and crafting handles by applying duct and electrical tape). We had a STAR WARS birthday party. My two year old daughter tries to breathe like Darth Vader; it's not at all threatening. Last month we watched the original trilogy, original versions. It's actually brought our family closer together. Now I think watching all six (prequels and Special Editions), then a few months later the original trilogy theatrical versions, will be an annual family tradition.